Since 1889, a spark of enterprise has evolved into a force in modern mining. .... fuelling growth over a century. The Singareni Collieries Company Limited (SCCL) is a Government coal mining company jointly owned by the Government of Telangana and Government of India on a 51:49 equity basis. The Singareni coal reserves stretch across 350 Km of the Pranahita – Godavari Valley of Telangana with a proven geological reserves aggregating to whopping 8791 million tonnes. SCCL is currently operating 18 opencast and 30 underground mines in 4 districts of Telangana with a manpower around 48,942. While historically technology has been a critical factor in SCCL's ability to reduce environmental impacts and occupational hazards, the need to constantly increase productivity and cut costs has demanded that the company goes in for phased mechanization and adapts state-of-the-art technologies. 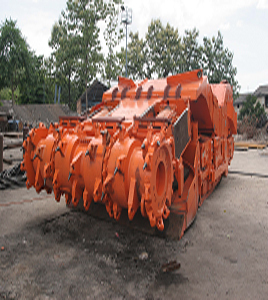 SCCL pioneered mechanization of coal mines in India by adopting coal drilling machines as far back as in 1937. In 1950 Shuttle Cars, Gathering Arm Loaders, Conveyors and Coal Plough Equipment were introduced. Later in a path breaking move to replace arduous manual labour, Road Headers, Load Haul Dumpers and Side Dump Loaders were gradually brought in. In 2002, Surface Miner Technology which not only facilitates cost reduction but also contributes to eco friendly mining, was introduced for the first time. Longwall technology in Under Ground Mining in 1983 and also Blasting Gallery (BG) Technology in 1989 were other notable introductions. Today, with 4 Longwall Panels and 5 BG Panels working in the company, mechanization of Under Ground Mines is being planned with state-of-the-art technologies like Continuous Miner and Punch Longwall. Already the mechanization of Under Ground Mining has seen the commissioning of 104 Side Discharge Loaders and 37 Load Haul Dumpers that have enhanced safety and productivity during the last four years. Other innovations in Under Ground Mines are 35 man-riding systems (chairlift and railcar) that have improved transportation inside the mines. In a state that is fast emerging as the IT hub of the country and hosts one of the Asia's largest Technology Parks, it was but natural that IT entered the realm of mining as well. And SCCL made a head start in harnessing the benefits of IT by developing proprietary software for integrated Open Cast and Under Ground Mine Management Systems. From automating the Personnel Records to Material Management Systems, many new measures were initiated in the IT sphere to improve productivity. To stay in tune with the online world, and keep customers and other stakeholders informed about the developments in SCCL, the company launched its website www.scclmines.com. Initiatives that have cemented SCCL's strength in IT are Video Conferencing, Integrated Mine Management Applications and e-procurement. Digitization of mine plans by Minex Software was yet another major initiative. This software supports core areas of geological data management, opencast and underground mine design and scheduling. Other IT initiatives that are on the anvil or are being implemented on an experimental basis include the use of Satellite based communication systems for monitoring Heavy Earth Moving Machinery using Global Positioning Systems and Biometric based Attendance Monitoring Systems. A dedicated cross-functional team forms the core of the Software Development Group to provide in-house software solutions and the company is all set to become an ERP based company in the coming years. While the benefits of coal are countless, Coal Mining is an inherently environment damaging and degrading activity. Realizing this, SCCL has launched a number of 'eco-friendly practices' to mitigate the damage to environment and improve the quality of life. In all mining areas extensive green belts have been developed, and monitoring of air and water quality is done on a regular basis to assess the impact of mining on the environment and corrective steps are being implemented immediately. Opencast Mines are being restored to pre-mining conditions. To encourage plantation and social forestry, free saplings are supplied to all the employees before the onset of monsoon. To reduce air pollution and also meet the social obligations of SCCL, the company supplies free LPG to its employees. SCCL is perhaps the only PSU to have introduced 'environment' as part of the curriculum in all its schools. In another innovative move, company has also introduced Eco Samman Awards to motivate employees who contribute to all round improvement of the environment. A number of other key initiatives taken in the last four years include setting up of Sewage Treatment Plants, Effluent Treatment Plants, Bio-engineering of Over Burdens, Clonal Plantations, Medicinal Plantations and development of Eco-parks for which the company was conferred the Golden Peacock Award from the Institute of Directors in 2005 and became the first Coal Company in the country to bag this prestigious honour. The company also bagged the "National Fly Ash Utilization Award” in 2005 for its unique contributions towards Fly Ash Utilization. SCCL has for the first time also brought out a book titled "Eco-friendly Coal Mining - The Singareni Approach" highlighting the various innovative practices initiated at SCCL for environmentally sustainable coal mining. The Company's HR Planning Initiative, with an annual spend of over Rs. 14 Crores, aims at Training and Development of all its human assets. With a well established HR Department and 10 Vocational Training Centers and the Nargundkar Institute of Management at Ramagundam (a full fledged training institute), imparting of in-house training and skill upgradation is a constant activity at SCCL. Community Development activities got an impetus when a social service organization - Singareni Seva Samithi (SSS) was formed by SCCL under the AP Public Societies Act. Training of unemployed youth and educating the families of workmen on the need to channelise their energies towards constructive activities is the basic purpose and philosophy of the Samithi. Towards this noble goal the SSS provides training in skill development to youth for recruitment in the Army, the Police and the Railways. The samithi also works innovatively on spreading awareness of AIDS, alcoholism and the benefits of thrift and small savings. In collaboration with the workmen and the Trade Unions, SSS has started extending its activities to the surrounding villages of the Coal Mining areas, and has been contributing to the development of these villages. Realizing what self employment does to empower dependent women, SCCL has not only been helping them acquire skills in applied crafts but also in facilitating them to set up their own enterprises. SSS has also been working towards making every workers' spouse literate. 442 Singareni Employees' children being recruited for the Army, Police and Para Military Forces. Around 34,000 illiterate workmen have been made literate. More than 4,400 youth have been imparted Vocational Training. Over 45, 000 people living in surrounding villages have benefited from the social service activities. Around 1,043 beneficiaries have become entrepreneurs and have started earning on their own. Singareni Collieries Company Limited (SCCL) has been awarded Infraline Energy Excellence Award 2007 under Corporate Excellence category - Black Diamond Award for coal sector development on 12th October 2007, at New Delhi. The Singareni Collieries Company Limited (SCCL) received the Indira Gandhi Vriksha Mitra Award - 2004 for outstanding contributions made in the field of afforestation and waste land development on 5th June 2007, at New Delhi. Environmental Excellence award for 2005-06 from Society for Research and Initiatives for Sustainable Technologies and Institution (SRISTI), New Delhi. Environmental excellence Award from Green Tech Foundation in 2005-06. "Golden Peacock Innovation Management Award 2005" from the Institute of Directors, New Delhi. "Golden Peacock Environment Management Award 2005" from World Environment Foundation, New Delhi. "National Fly Ash Utilization Award 2005" jointly instituted by the Ministry of Environment and Forests, Power and Science and Technology, Government of India. The Second Best Corporate Film Award 2005 by Public Relations Society of India, Hyderabad for "Shramika Bandham" a telefilm. Three of the fourteen "National Safety Awards (Mines)" instituted by the Directorate General of Mines Safety, Government of India in 2004 (pertaining to 2001). "Best Workers Welfare Activity Award" for 2003-04 by the Federation of Andhra Pradesh Chamber of Commerce and Industry (FAPCCI). "Best Overall Performance Award" for 2002-03 by the Federation of Andhra Pradesh Chamber of Commerce and Industry (FAPCCI). "Best Management Award" for 2001-02 by the erstwhile Government of Andhra Pradesh. MOU with ONGC, to collaborate in areas of Surface Coal Gasification, Coal Bed Methane and Under Ground Coal Gasification technologies. Relationship Agreement with CSIRO, Australia, to share advanced technologies in UG mining. Joint venture partnerships with NTPC and other power utilities in Coal Mining in India and overseas.2001-2002. MOU with CARBON ENERGY Inc., Australia to collaborate in areas of Surface Coal Gasification, Coal Bed Methane and Under Ground Coal Gasification technologies. Consultancy services in exploration and surveying. Shaft sinking and high speed tunneling. Surface Miners in OC mines for selective mining. Continuous Miners in UG mines. Setting up Captive Power Plants. Dry de-shaling/de-stoning technology to improve quality of coal. Highwall Mining to exploit uneconomical deposits of opencast mines. New benchmarks in production have been created. New heights of productivity have been scaled. New technologies are being deployed. With innovative management practices and eco-friendly measures aimed at the welfare of the workmen, there is a new buzz at Singareni.